Charming 1-bedroomed studio with private pool. San Agustin - Countryside location, just a short drive from many fabulous beaches, and wonderful restaurants. Delightful air-conditioned 1-bedroomed studio in the Ibiza countryside with private swimming pool. It has an outside dining terrace and gazebo by the pool. It is in a handy location for beaches, shops, bars and restaurants. The charming village of San Agustin is within walking distance. There is a lovely very old church, and three great and very different restaurants. A wonderful place to eat at night, very tranquil. A three-minute drive away is the bigger village of San Jose. It has lots of bars, restaurants, shops. Some of the bars have live music at night in summer. Seán plays with his bands, maybe come to a gig and have a beer?! There are several beautiful beaches just a short drive away,like Cala Conta, Cala Bassa, Cala Tarida, all on the West of the island for the wonderful Ibiza sunsets. We have lived Ibiza for many years, Sheron is an accountant, and Seán is a well known local musician. 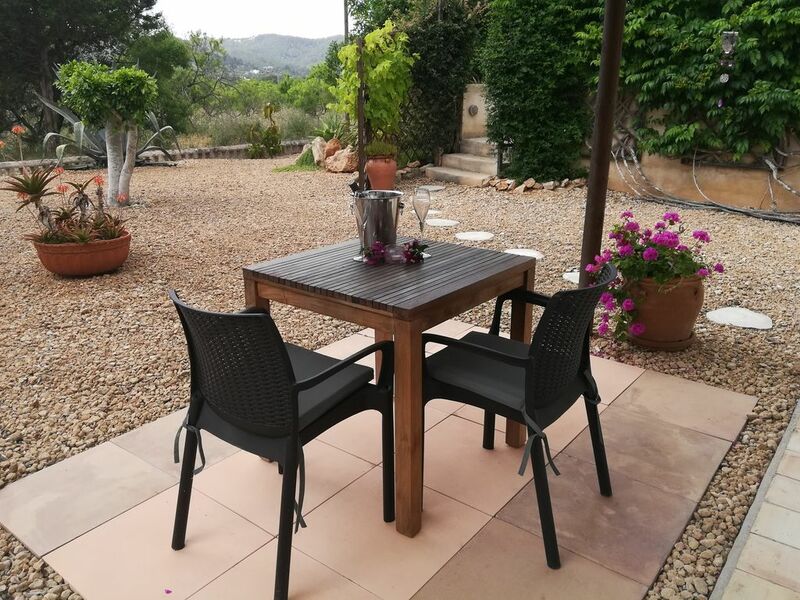 We just love the village of San Agustin and the surrounding countryside and the location is so handy as a base to explore Ibiza. This is a chance to have a completely private studio and pool without having to rent a large shared villa. Pool terrace with a shady gazebo surrounded by mediterranean gardens plus a patio/terrace with table and chairs right outside the studio. For the exclusive use of the couple renting the studio. Notes on accommodation: The Studio is an annexe to the main house with its own private entrance. It has a lounge with kitchen and breakfast bar, 1 double bedroom en-suite, ideal for couples. Bathroom with large shower. Fully equipped kitchen. Amenities/facilities provided: 2 ringed ceramic hob, built-in microwave with grill, fridge-freezer, iron and ironing board, hair drier, satellite TV, wi-fi connection, safety deposit box. The studio is light and airy but has air-conditioning and ceiling fans. There is parking just to the side of the Studio. Outside: Outside terrace perfect for eating al-fresco and for watching the stunning sunsets! The sunny pool terrace is surrounded by a mature mediterranean garden with a shady gazebo for when you need to cool off.The pool area is private and for the exclusive use of guests. This studio was everything we could have hoped for and more! The reality surpasses the listing! Hi Paresh and Helen, we're happy you enjoyed your time at Studio San Agustin! Thank you so much for the kind review, and all the best to you both! This place had everything we needed for our stay. Great location near beaches and lovely village of San Agustin plus easy to get around the island. The private pool area was fantastic and a wonderful place to relax. Owners were just great and we would highly recommend this place for a couple looking for some private space without needing to rent a larger villa. We had such a lovely time staying here with Sean and Sheron. They were friendly and welcoming and the studio was absolutely spotless and even lovelier than in the photos. We had everything we needed to relax and the pool was stunning and equipped with sun loungers, umbrellas and towels for our use. Close to the small town of San Jose where there are supermarkets restaurants and shops. Would highly recommend this studio! Thank you so much Sean and Sheron! Thanks guys for the lovely comments! You're welcome back anytime! We spent a perfect week here. Cannot recommend it highly enough. The pool was superb and wonderful for cooling off, especially as we were there during the hottest summer recorded for many years! Completely private - an excellent choice for a relaxing holiday. Nothing was too much trouble for Sean and Sheron the owners. Studio was very clean and we found the Sky TV and WiFi all welcome additions. We'll definitely be going back! Cheers guys for that nice review! We're delighted you enjoyed your time here, and as we said, you're welcome back anytime! Studio "San Agustin" is very handy for all the beaches on the west side of the island, so great for watching the fabulous Ibiza sunsets. (which can also be seen from your own terrace at Studio San Agustin). Cala Conta is 15 mins away. Cala Tarida is 15 mins away. Es Cubells is 20 mins away. Port des Torrent is 7 mins away. Ibiza is a small island, so the coast and beaches are never far away. Ibiza airport is a 20 minute drive. We highly recommend that you hire a car at the airport . The studio is a wonderful base from which to go and explore this wonderful island. Please remember to book your car as soon as possible to avoid disappointment in high season. San Agustin village is a short walk away. San Jose is a 3 minute drive. San Antonio is a 10 minute drive. The village of San Agustin and the town of San Jose have many wonderful restaurants and bars, including some with live music/entertainment. There are also many shops and supermarkets. Booking Notes: 50% of the cost is payable at the time of booking and the remaining 50% is payable 2 weeks prior to arrival, or in cash ( euros ) at check-in. Also a deposit of 200 euro is taken in cash upon arrival ( not to be paid on-line beforehand ) as security against damages and, all being well. will be returned at check-out. Changeover Day: Changeover day is usually Saturday but we can be flexible. Arrival is after 14.00 hours and departure by 11.00 unless otherwise agreed.